Those pesky Chimera beasts just wont give Planet Earth a break, will they? After knocking some sense into the alien invasion in the original PlayStation 3 trilogy, the time has come for PlayStation Vita owners to join the colossal war. 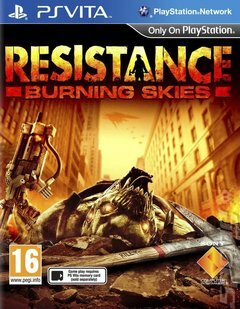 You play as firefighter-turned-Resistance member Tom Riley, who is tasked with helping turn the enemy away during an attack on New York City. Tom only has one primary objective though, in spite of all the alien action going on around him - his family. He needs to make sure his nearest and dearest are safe. But things take a strange turn as it appears Toms involvement in the war is much more significant than originally thought. This is a no-holds barred first-person shooter experience on PlayStation Vita. With the dual analog sticks, you can be as immersed in the action as you would during a PlayStation 3 home console game. Secondary functions of the weapons you wield are mapped to the Vitas touchscreen. Along with a meaty single-player campaign, Resistance: Burning Skies offers eight-man online multiplayer over PlayStation Network. Deathmatch, Team Deathmatch and Survival modes ensure that your portable fight against the Chimera will be a long and satisfactory one. Fight for humanity anywhere you like!